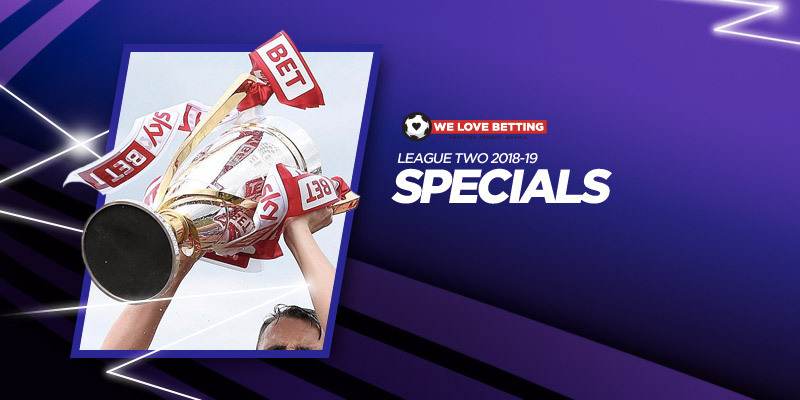 EFL fan Ben Levene (@benlevene96) has scoured the dozens of League Two specials markets and has shared his best bets ahead of the 2018/19 big kick-off. At the first-time of asking, Lincoln under Danny Cowley made an impression that justified their highly-rated status. The year prior, Lincoln dominated the National League whilst mounting an infamous run to the FA Cup quarter-finals. In their first season back in the league, the Imps finished seventh before losing out in the play-offs to Exeter. Once again, Cowley’s squad proved their depth by charging to Wembley in the EFL Trophy. Depth is a massive point in Lincoln’s favour, as it is a tool possessed by few of the fourth-tier. As is the nature of the Football League, a mini overhaul has occurred at Sincil Bank but it’s fair to suggest Lincoln have come out the other side even stronger. Left-back Harry Toffolo has featured in 77 Championship and League One games and the 22-year-old former England youth international brings great pedigree having come through the ranks at Norwich. More familiar might be frontman John Akinde who, with all due respect, carried Barnet to successive survivals before an injury-stricken term last season. The 6”2 target-man scored 56 goals in 121 games over the past three-seasons for a side that finish 15th-15th-23rd. Last season Matt Green was the only player to hit double figures, so Akinde could add an edge to a side who boasted the divisions fourth-best defence in 2017/18. If last season’s play-off heartache wasn’t enough to stand the Imps in good stead for the upcoming year, perhaps the addition of Michael O’Connor can help. The central midfielder joins after two years as Notts County’s club captain and has twice won promotion in the Football League. Along with EFL veteran Lee Frecklington, O’Connor can form a duo that are integral to the core of Lincoln’s direct 4-4-2. Bruno Andrade too comes in, after netting 20 times in Boreham Wood’s run to Wembley last season. Since 2004/05, 46% of sides to lose in the play-off’s went on to finish inside League Two’s top-seven at the next time of asking. Meanwhile, in the last 13 seasons, the side with the best defensive record (or joint) won promotion in 12 of campaigns. As already suggeseted, Lincoln allow very few goals against. As well as conceding only two goals more than League Two’s best defence last season, Lincoln ranked fourth for Shots On-Target ratio last term – the three teams better placed were all promoted. Harry Kewell found himself under mounting pressure early last season, but ultimately came out the other side. His Crawley Town team finished in 14th spot. Shrewd summer business means the Aussie’s outfit can be backed to make further strides up the table. The additions of the experienced duo Romain Vincelot and Ollie Palmer add physicality and know-how at both ends of the park. Pacey-forward, Domonic Poleon, joins after nine-seasons as a part of squads in higher divisions. Filipe Morais has also joined form Bolton. Following a 2-0 pre-season defeat to Charlton – Kewell stated that Vincelot and Morais mean we’ll ‘see a different Crawley’. At 5/2 we can chance them to secure a top-12 finish. Dino Maamria’s side took to a high-altitude training camp in Slovenia as they look to take the fourth-tier by storm. The talented Ben Kennedy has enjoyed a good pre-season, while winger James Ball has also shone. Up top however, is where Boro’s strength lies. Only Luton, Wycombe, and Notts County scored more goals on home turf than Stevenage last season. Danny Newton caught the eye in his first campaign in the Football League, after joining from Jamie Vardy’s V9 academy. If the tenacious forward wasn’t enough of a handful, he’ll be partnered by targetman Alex Revell, who’s proved an awkward opponent at all spheres of the EFL – Revell scored six in 12 for Stevenage last season. Maamria has spoken of developing a brand of football whilst he’s drawn reference to organisation. With a centre-back pairing of Scott Cuthbert and Ben Nugent – Boro will be exactly that. William Hill give them a 22 point start on the seasonal handicap. If things click at the Lamex, they could be far closer to the top than that mark suggests.